Snakehips is coming to The Wiltern on Friday 20th October 2017! One of the biggest artists on the mainstream Dance music scene right now is of course, Snakehips with the massive singles, "All My Friends" "Days With You" "Gold" "Don't Leave" "Poison" "No Other way" – these are just a few! With all of the excitement around the Fall tour, it is bound to sell fast! Come join the party, get your friends together and get down to the beats and the anthems LIVE in concert! Tickets available today! 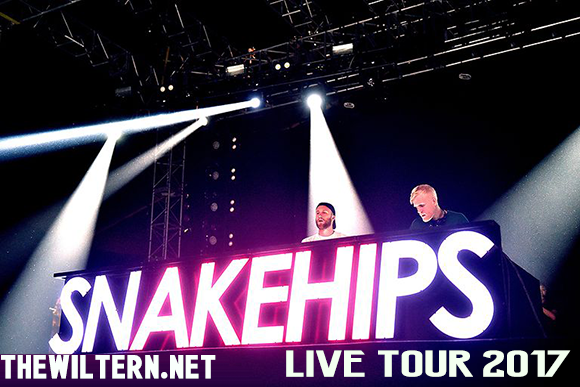 With their upbeat, feel good and heartfelt Dance based music… Snakehips are one of the best names right now on the Electronic scene it's no surprise that these guys plus featured singers are packing out venues not just in the UK but all around the globe and there's no stopping them as they now hit the road in 2017 across North America! Don't miss out! "Since first meeting and deciding to collaborate almost five years ago, the much hyped producers, James Carter and Oliver Lee, have gone from strength to strength as they have continued to gain new fans with their blend of bright pop melodies and dusty R&B beats. With their newly released single Cruel, featuring Zayn, currently climbing up the charts and receiving airplay all over the place, their rise is showing no signs of slowing down yet."